Why only make one person happy with a gift? 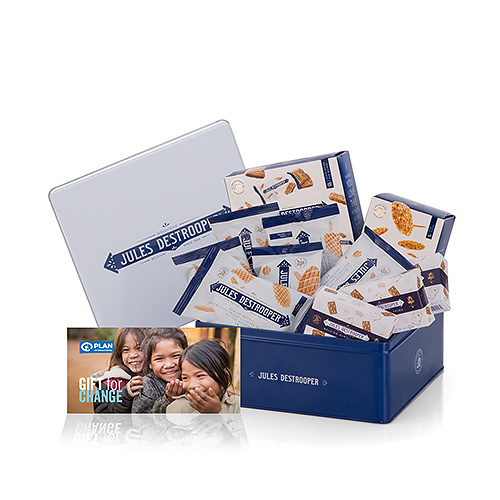 Surprise your friends, family, and business relations with a tin box filled with delightful Belgian Jules Destrooper biscuits and, at the same time, provide a young child with a nutritious breakfast for a year. This gift box is filled with Destrooper classics, including the sweet and crispy Almond Thins, the Butter Waffles ,and Caramelized Butter Biscuits. Everything is in snack packs or mini packaging, super handy for on-the-go treats anytime. Thanks to this Office Treats Gift Box, Plan International Belgium is able to provide a child with a nutritious breakfast for a whole year. Children at all Plan kindergartens are served a nutritious breakfast. That ensures they have the energy and concentration to enjoy a day of learning in class. Breakfast for children is an investment in the future! Ingredients: Wheat flour, candy powder, butter (13%)(milk), almonds (10%), sea salt, raising agent: sodium carbonates. Allergy Advice: May contain soy, eggs, hazelnuts and cashews.